Yes, yes...I know. Another mango product review. Believe me, I'm SICK of mango stuff. 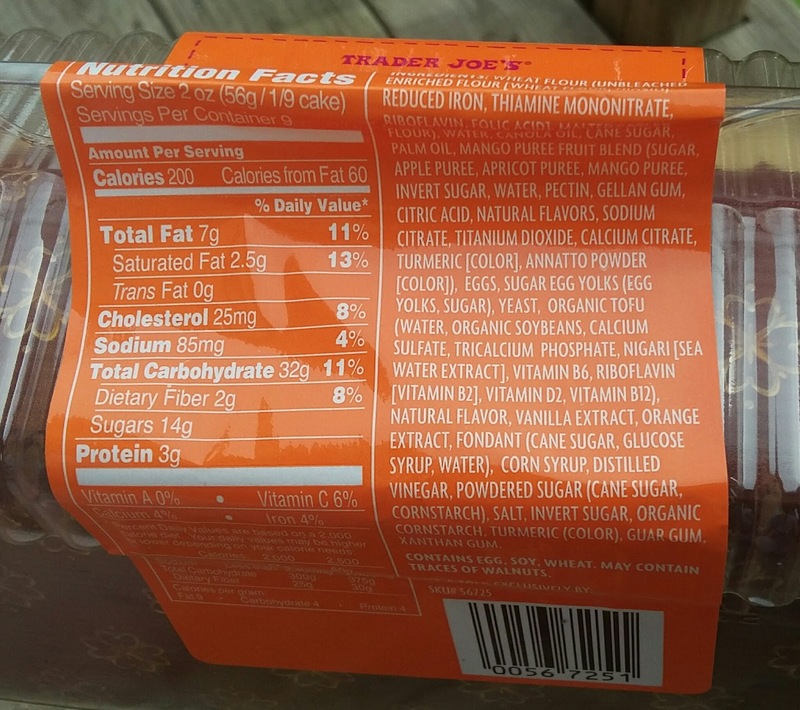 It's part of the gig - Trader Joe's leads a mango onslaught, it's my job to figure out what's good and worthwhile, and what simply isn't. Way too many products have been middling at best thus far. Seems even the TJ's employees I've talked to, informally, are tired of mango everything. Well, here's a proclamation: I (Russ), as of the completion of this review, am DONE with any mango-related review from now on until eternity. Pretty much the only exception would be IF (and it's a big part two-part IF) something truly amazeballs would debut, like, say, mango cookie butter, and I drove to South Jersey first, and chloroformed the Rodgers clan to make sure I got to it first. That's...probably not going to happen, Pennsylvania turnpike tolls being what they are. 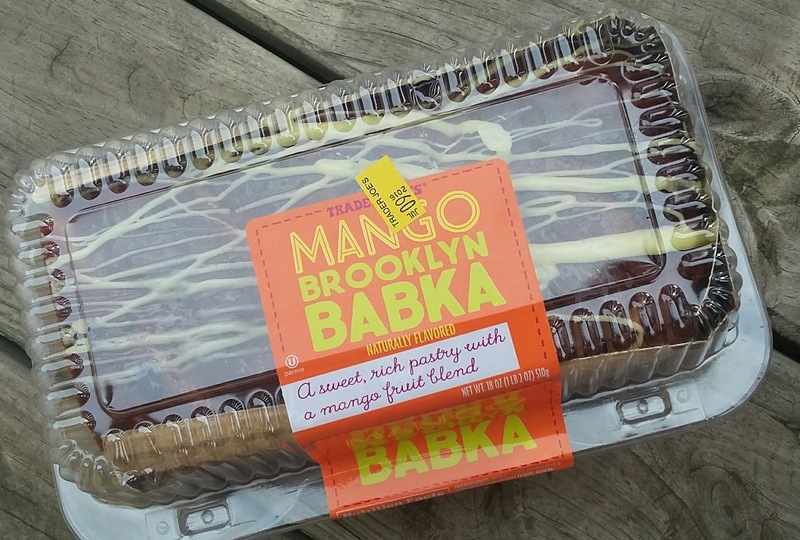 But I'd be absolutely derelict in my duties if I didn't tell you about Trader Joe's Mango Brooklyn Babka. Hands down, it's our absolute favorite TJ mango concoction we've had yet. And this is coming from a very mango-weary man. It's been multiple-purchase worthy, which for a treat and non-staple, is very, very high praise for our establishment. It must be said this babka is my only frame of reference for babka - I've led a sheltered life. 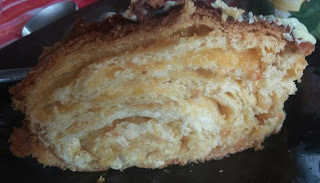 It's a large, weighty pastry loaf which I'd liken most closely to a danish - it's chewy and layered yet kinda flaky. I guess there's a certain denseness to it, but not as much as what I've heard re: the chocolate babka ("condensed brownie" are the words I recall). No, a slice will practically fall apart along the dough spiral lines, with a sweet, sugary, but not overkill mango puree swirled in, with extra mango flavor coming from the faintly orange dough. A little light mango glaze on top adds just that little extra oomph as well. A little look at the ingredient list offered a surprising insight that might explain this product's overall success: that "mango puree" I mentioned? It's apples, followed by apricots, and then the mango. It's odd, because it is decidedly mangotastic...maybe the apples offer a suitable base, while the apricots seamlessly boost the flavor...I don't know...but it works. No question about it. A slice of babka with a cup of coffee makes a nice little morning treat, or skip the coffee for some dessert. I've heard there's ways to grill babka slices (which would be awesome here, I think) or get a scoop of vanilla ice cream to go alongside. Lots of good possibilities here. If even half the mango stuff out there, in its own context, tasted as good as this babka does, there's no doubt that the Summer of Mango would have been a blockbuster. I agree about how delicious this is even though I'm mango weary, too. Our TJ's was sampling it, and it's still on my mind. It's definitely a winner. They were sampling this in my store a few weeks ago and I had two pieces. It's beyond delicious. Think I've seen these too...be on the lookout! I was skeptical about this, but it looks like i'll have to try it. Thanks!